Review: Shrek is an Ogre who travels to meet a queen so he can be king. Brilliant!! The script was fantastically written. Really funny all the way through. 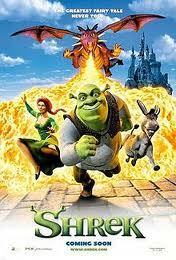 Shrek is based on a children’s book by author William Steig. At the Academy Awards in 2002 it won 1 Oscar and that was for Best Animated Feature. The same year at the Baftas it won another award and that was for Best Screenplay – Adapted. It took more than four and a half years for the computer animation production team to do this film. This series is on Barry Norman’s list of 100 Greatest Films of all time that he produced at the start of 2012 in the Radio Times. One film critic wrote ‘The Movie is a constant delight for its exuberant simplicity, its avoidance of sensational effects, its wit and a true feeling that transcends sentimentality’.